Will Gustafson, the new owner of Plantation Golf Course, reached out in recent days to the Save Plantation Coalition and others to talk about his emerging plans. The bottom line: Mr. Gustafson says he wants to develop a portion of Plantation but also to reconfigure and improve the course, which he said would remain an 18-hole setup, but obviously a little shorter. Mr. Gustafson repeated that pledge Wednesday in an interview with Ch. 7 on Wednesday, but the details remain vague. We welcome his statements and are certainly willing to talk with him about these plans. Much is going on, and we ask you to stay involved because we will need your participation and support in coming days and weeks. Seems like it makes better sense to work with him rather than against him. 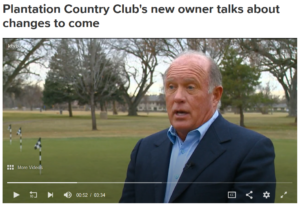 Cliff — We certainly agree, and the pitch that Mr. Gustafson has made — targeted development, a shorter-but-improved, 18-hole golf course, long-term preservation — has a lot of appeal. As with all big things, the proof will be in the details, which are expected to shake out by mid-year. That’s why we are asking people to stay engaged, so we can encourage the Gustafson team and Garden City to support the best possible outcome for Plantation and the community. Mr. Gustafson is now our owner. Let’s take the team approach and work together for the common good.